Image captured on 2 February 2019, by the MODIS instrument, on board NASA's Aqua satellite. 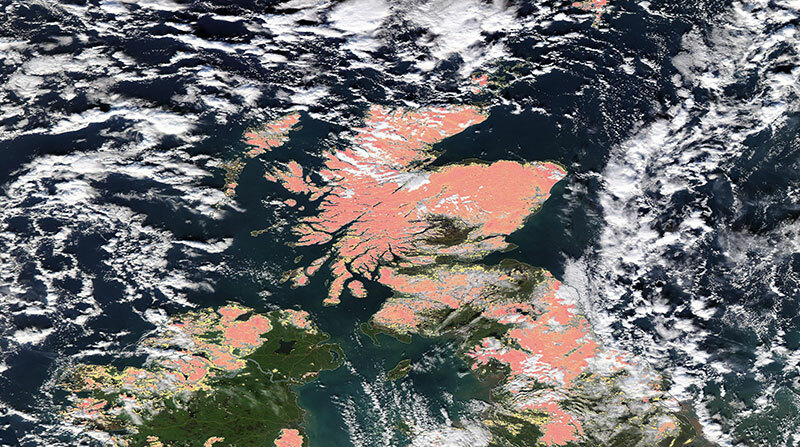 Image of Snow across Scotland, acquired on 2 February 2019 by the Moderate Resolution Imaging Spectroradiometer (MODIS) instrument, on board NASA's Aqua satellite. This image shows the Snow Cover (Normalized Difference Snow Index) overlaid on a Corrected Reflectance image. The pink areas represent areas covered in snow. Using the comparison feature, you can use the swipe tool to compare the imagery from the same day, with the snow cover (Normalized Difference Snow Index) show on the left, and the Corrected reflectance imagery on the right, where the snow shows as white on the ground.